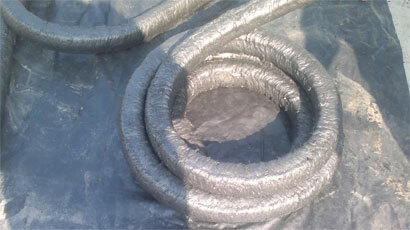 Graphite Coated Ceramic Rope is a compression packing for very high temperature duties. It is manufactured from an exceptionally stable fibre material that is soft, non-irritating, non-hazardous & is not limited by World Health Organisation or European Union restrictions. Ceramic Fiber Rope, Tape, Cloth contains no organic agents or processing additives. It therefore retains its physical and chemical properties at very high temperatures and does not decompose into hazardous substances, as happens with many normal ceramics. Compression packing of Ceramic Fiber Product Hi-Temp are recommended for very high temperature static sealing duties or slow rotary applications. It replaces ceramic yarn packing and radiation seals on BOS plant, and ceramic packings and vessel lid seals on secondary steelmaking plant. Other examples include door seals for annealing furnaces at steelworks, KILN Packing, protective surfaces on pottery kiln cars, and stem gland sealing on valves handling very high temperature gases. Hi-Temp is available as densely braided compression packings - square, round and rectangular - in sections from 5mm to 200mm, and in any length. Full fitting instructions are included.